امامی, رضا, رضاپور, مهدی. (1391). مقیاس بزرگی محلی (ML) برای البرز مرکزی. 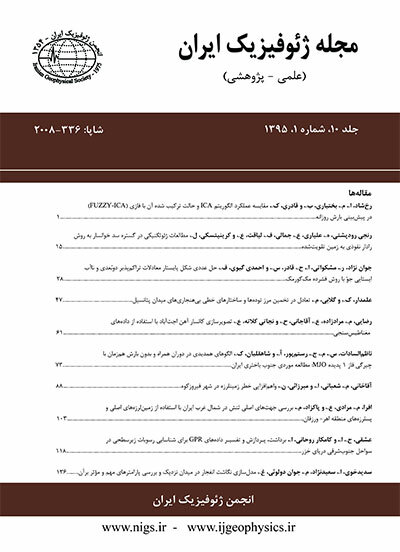 مجله ژئوفیزیک ایران, 6(3), 59-71. رضا امامی; مهدی رضاپور. "مقیاس بزرگی محلی (ML) برای البرز مرکزی". مجله ژئوفیزیک ایران, 6, 3, 1391, 59-71. امامی, رضا, رضاپور, مهدی. (1391). 'مقیاس بزرگی محلی (ML) برای البرز مرکزی', مجله ژئوفیزیک ایران, 6(3), pp. 59-71. امامی, رضا, رضاپور, مهدی. مقیاس بزرگی محلی (ML) برای البرز مرکزی. مجله ژئوفیزیک ایران, 1391; 6(3): 59-71. که r فاصله کانونی برحسب کیلومتر و A0 دامنه برحسب میلی‌متر است. منحنی تضعیف به‌دست آمده در این تحقیق نشان می‌دهد که تضعیف امواج لرزه‌ای در البرز مرکزی نسبت به ناحیه کالیفرنیا بیشتر است. مقدار Q با توجه به مقدار 0029/ 0k = به‌دست آمده در روش ناپارامتری و استفاده از فرمول باکن و جوینز (1984) و فرض VS= 3.3 km/sec، برای تناوب یک ثانیه حدود 150 به‌دست آمد. تغییرات زمین‌ساختی پوسته منطقه بعد از پرکامبرین و فعالیت‌های آتشفشانی در منطقه را می‌توان از عوامل اصلی کم بودن مقدار Q برشمرد. تصحیحات ایستگاهی به‌دست آمده نشان می‌دهد که ایستگاه انجیلو (ANJ) از شبکه لرزه‌نگاری سمنان و ایستگاه پرن (PRN) از شبکه لرزه‌نگاری ساری به‌ترتیب دارای تصحیحات ایستگاهی 725/0 و 378/0- واحد بزرگی هستند. The availability of a large amount of the data recorded by the Iranian Seismic Telemetry Network (ISTN) has motivated this study to develop relations for the routine determination of ML scale for Central Alborz region of northern Iran. The ML is commonly used in engineering because it is determined within the frequency range (0.5-3 sec) of interest in most of such applications. For any comprehensive seismic hazard analysis, one needs a calibrated magnitude relationship as well as an earthquake catalog for the study region. It is a well-known fact that the regional geology has a great influence on magnitude relations. Therefore, for each seismic region a specific magnitude relation has to be developed. The ML scale is based on the arithmetic mean of horizontal components of the synthesized Wood–Anderson seismograms. We used both nonparametric and parametric methods for inversion. We used a large dataset of 3886 events including 62031 waveforms which recorded by Tehran, Semnan and Sari seismic networks during 02/03/1997 to 13/03/2011. These seismic networks comprise of 19 three-component stations. We calculated the associated synthesized Wood-Anderson seismogram for each SS-1 waveform which records the velocity. Based on Richter’s method, we used amplitudes which are arithmetic means of those of horizontal components. Richter’s ML formula first developed for southern California and Savage and Anderson introduced a nonparametric least-squares inversion method which has been used by others. In this method, the amplitudes recorded at arbitrary distances are linearly interpolated to yield values for the attenuation curve at some fixed distances. In this study, we used both methods. The resulting equations are -logA0 = 0.9819log(r / 100) + 0.0028(r - 100) + 3.0 and-logA0 = 1.076log(r) + 0.0029(r) + 0.5580 from parametric and non-parametric methods, respectively. Where r is hypocentral in kilometer and A0 is amplitude in millimeter. The two methods yielded very similar results. Unlike the parametric method, the nonparametric one does not impose any a priori assumption of the shape of the attenuation curve on the data and has the potential to detect hinges in the attenuation curve that are caused by structural boundaries such as Moho or geological variations affects on the attenuation curve. Thus the result obtained by nonparametric method was chosen as the final result. Bakun and Joyner (1984) give the following formula for the Q / f ratio: taking an average S-wave crustal velocity of VS = 3.3 km/sec, the k value obtained by the non-parametric method, 0.0029, would imply a Q / f ratio of 150 in Central Alborz, Iran. رضاپور، م.، 1382، بررسی داده­های ثبت شده و تعیین بزرگی در شبکه لرزه­نگاری تهران: فیزیک زمین و فضا، 2(22)، 55-65. رضایی، ر.، 1389، تعیین مقیاس ML برای شمال­غرب ایران: پایان­نامه کارشناسی­ارشد ژئوفیزیک گرایش زلزله‌شناسی، مؤسسه ژئوفیزیک دانشگاه تهران. Aki, A., and Richards, P. G., 1980, Quantitative Seismology: 2 vols, Freeman, San Francisco. Alsaker, A., Kvamme, L. B., Hansen, R. A., Dahle, A., and Bungum, H., 1991, The ML scale in Norway: Bull. Seism. Soc. Am., 81(2), 379-389. Ambraseys, N. N., and Melville, C. P., 1982, A History of Persian Earthquake: Cambridge University Press, London, 219 pp. Anderson, J. G., 1991, A preliminary descriptive model for the distance dependence of the spectral decay parameter in southern California: Bull. Seism. Soc. Am., 81, 2186–2193. Askari, R., Ghods, A., and Sobouti, F., 2009, Calibration of an ML scale in the Alborz Region, Northern Iran: Bull. Seis. Soc. Am, 99(1), 268–276. Aster, R. C., Borchers, B., and Thurber, C. H., 2005, Parameter Estimation and Inverse Problems, Elsevier Academic Press, Burlington, Massachusetts. Bakun, W. H., and Joyner, W. B., 1984, The ML scale in central California: Bull. Seis. Soc. Am, 74, 1827–1843. Berberian, M., and Yeats, R. S., 1999, Patterns of historical earthquake rupture in the Iranian plateau: Bull. Seis. Soc. Am, 93, 120–139. Hutton, L. K., and Boore, D. M., 1987, The ML scale in Southern California: Bull. Seis. Soc. Am, 72(6), 2074-2094. Kanamori, H., and Jennings, P. C., 1978, Detemination of local magnitude, ML, from strong motion accelerograms: Bull. Seis. Soc. Am, 68, 471-485. Kim, W., Y., 1998, The ML scale in Eastern North America: Bull. Seis. Soc. Am, 88(4), 935-951. Langston, C. A., Brazier, R., Nyblade, A. A., and Owens, T. J., 1998, Local magnitude scale and seismicity rate for Tanzania, East Africa: Bull. Seism. Soc. Am., 88, 712–721. Lay, T., and Wallace, T. C., 1995, Modern Global Seismology: Academic Press, San Diego, California. Menke, W., 1984, Geophysical Data Analysis: Discrete Inverse Theory: Academic Press, Orlando, Florida. Miao, Q., and Langston, C. A., 2007, Empirical distance attenuation and the local magnitude scale for the central U.S.: Bull. Seism. Soc. Am., 97, 2137-2151. Nuttli, O. W., 1973, Seismic wave attenuation relations for eastern North America: Journal of Geophysical Research, 78, 879-855. Pujol, J., 2003, Determination of a local magnitude scale: A generalized inverse solution: Bull. Seis. Soc. Am, 93(6), 2758–2761. Richter, C. F., 1935, An instrumental earthquake magnitude scale: Bull. Seis. Soc. Am, 25, 1-32. Richter, C. F., 1958, Elementary Seismology: W. H. Freeman and Co., San Francisco, 758 pp. Savage, M. K., and Anderson, J. G. 1995, A local-magnitude scale for the Western Great Basin-Eastern Sierra Nevada from synthetic Wood- Anderson seismograms: Bull. Seism. Soc. Am., 85, 1236–1243. Uhrhammer, R. A., and Collins, E. R., 1990, Synthesis of Wood-Anderson seismograms from broadband digital records: Bull. Seism. Soc. Am., 80, 702-716.